Yearly conference at Blue Ridge Assembly, Black Mountain, North Carolina. This conference brings together health practitioners from varied fields. Presentations include botanicals for radiation protection, childhood stress, high altitude sports, brain trauma, dental health, pelvic stagnation, migraines, memory, women and sexual dysfunction, sinusitis, mental imbalances and more. Pre-conference intensive with Donald Yance on Integrating Cytotoxic Plant Medicines into a Cancer Treatment Plan. Speaker: Vickie Shufer. Discover the nutritional and health benefits of wild plants that can be..
Panelists: David Crow, Jill Stansbury and Roy Upton. A look at herbs from ancient traditions wi..
Speaker: Teresa Boardwine. 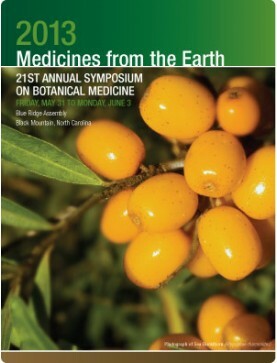 A discussion of specific herbal therapeutics for the most common fungal i..
Speaker: Deborah Frances. Differentiations for the use of black cohosh, dong quai, lady's mantle, sh..
Speaker: Kathleen Maier. This follow-up to the Kidney Yin and Adrenals class (catalog number 13..
Speaker: Deborah Frances. Discussion highlights the specific indications of several herbs used in th..
Panel. Jerry Cott, David Winston and Donald Yance. What do studies on botanicals actually prove..
Panelists: Mary Bove, Deborah Frances and Kathleen Maier. Herbal medicine can provide assistanc..
Speaker: Aviva Romm. Millions of Americans experience chronic daily pain. NSAIDs, narcotics, an..
Speaker: Kathleen Maier. Chronic endocrine dysfunction and aging often manifest as dry, atrophi..
Speaker: Aviva Romm. The overuse of antibiotics is a serious global health threat and is becomi..
Speaker: Kathleen Maier. Many common weeds are cooling remedies used by traditional peoples for cond..
Speaker: Jerry Cott. The design of NIH-sponsored clinical trials in St. John's wort for depression, ..